While insulating your Michigan home is often recommended to reduce heating costs and maintain optimal home comfort, it can actually cause some issue with regards to the air quality within your home. Well-insulated homes often trap unwanted particles and volatile organic compounds inside, which will ultimately be circulated through your cooling system. With this, we recommend our fellow Michigan homeowners utilize an ultraviolet air purifier to keep the air quality within the home optimal. Having said that, Applegate offers Honeywell’s 24V Ultraviolet Air Purifier to Michigan residents seeking cleaner air within the home. If you haven’t considered the air quality in your home, now’s a good time to learn how it can affect those inside. Plus, with the aforementioned air purifier, you can achieve clean air with ease. Take a moment to learn more about our ultraviolet air purifier and the effects of airborne particles. As you can see, whether it be the result of painting a room in your home or just your average dust accumulation, the air inside your Michigan home can easily become polluted with unwanted particles, which could ultimately lead to health effects. For instance, mold is known to cause respiratory illnesses as the cooling system in your home can spread the mold spores throughout. Fortunately, an air purifier can help eliminate the aforementioned particles and pollutants. Because mold spores are a common occurrence in regards to poor air quality, the UV air purifier is designed to eliminate mold spores on the air conditioning coil, which helps improve airflow. The AirBRIGHT™ system, on the other hand, utilizes ultraviolet rays and carbon cells to capture odor-causing particles and transforms them into harmless water vapor. With little to no maintenance required, the UV air filter allows you to carry on with daily life as it works to keep the air within the home clean and free of harmful particles. Considering the energy efficiency and cleaner air offered by a UV air purifier, having Applegate provide your Michigan home with one is highly recommended. 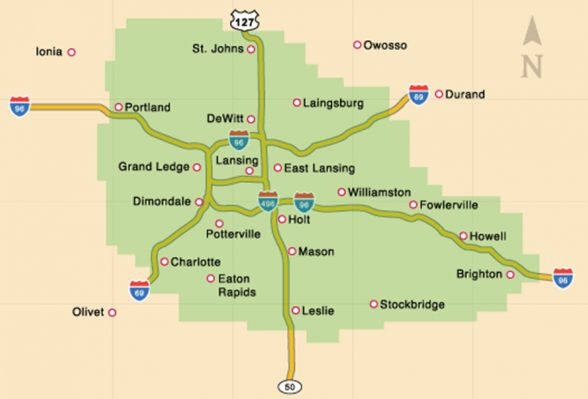 Michigan is known for its humid climate and, when combined with particles and pollutants from pets, appliances, and other factors, the air within your home could be quite harmful. If you’re interested in maintaining cleaner air in your home, contact Applegate today. You can also give us a call at 517-337-7700.